You can access your school account by clicking on your name in the top right hand corner of the Explore page. 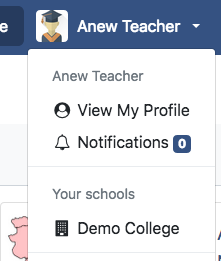 This will display a drop down menu where you will be able to see the name of your school. Click on the name of the school to access its account. It contains links to information to help you start using your school account. The main part of the dashboard displays a graph of recent activity in your institution and can be displayed according to the different date ranges shown above the graphs.